Musings of The Mom Jen: "Mock"tails Anyone? Home > guest post > "Mock"tails Anyone? Another fabulous guest blogger for you guys, welcome Shelly! Hey y’all. 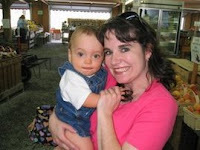 I’m Shelly and I write the Chic Crafty Chick blog. I saw Jen send out an SOS for guest posts and I jumped at the chance to write a guest post. This is my first time writing a guest post for someone, so I’m very excited. Here is a quick blurb about me. I’m a stay at home mom and I have two little boys who are my miracles. Our oldest son, Sawyer who is now three, was a micro preemie and was born at 25 weeks weighing a whopping 1 pound 12 ounces. My second son, Logan who is nine months old, I was blessed to carry full term. Getting to that point was a miracle, so he is my miracle baby too. I have a wonderful husband who I’ve been married to for eight years. We have a Boston Terrier named Zoe who is six and was our first child. You can’t forget the fur child. Any Boston Terrier lovers in the house? Holla. How lucky is Jen to be going on a fun trip to San Diego? I’m so jealous because I love San Diego. I know they will have a fabulous time. One of my favorite things in San Diego is the zoo. If you have the chance to visit, be sure to go to the zoo. There are so many cool animals. During the summer, I love finding different drink recipes that don’t require alcohol. Because as we all know “Sippy Cups are NOT for Chardonnay”. 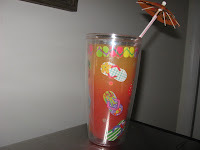 LOL Back in June I featured a number of nonalcoholic recipes aka “Mocktails” on my blog. I thought y’all might enjoy them, so here are two I’d like to share with you. The first recipe uses Simply Best Orange Juice. I used their Orange/Pineapple blend juice to make this. As you can see, I have a pretty large glass. What I did was pour a can of 7Up in the glass. Then I filled the rest of the glass with the Orange/Pineapple juice. It was no more than 1/2 a cup. After that I added about a teaspoon (I'm guessing, I just eyeball it) of grenadine syrup. That is what gives it that pretty red color at the bottom. Add your straw and you are in business. It would also be good to add maraschino cherries to this drink, but I didn't have any. How do you like my fancy umbrella tucked in my straw? I'm may not be sitting on the beach in Maui having Mai Tais, but I can still enjoy something fun at home. So, I suggest you get yourself some cute straws and little umbrellas for your drinks. In the past I've seen unique things like that at Pier One. Don't you just love my fun glass? I got a set of those a few years back at Stein Mart. I just love using them in the summer. If you are looking for something cute like that I'd of course check Stein Mart, but if you don't have that in your area then I'd check Kohl's. They have cute glasses for the summer too. And of course who could forget checking out the Target. My second recipe is for cherry limeaide. I LOVE cherry limeaides. For those of you who may have never had one, it is a little bit of sweet heaven in a glass. It combines fizzy and tart and sweet all in one. The fast food chain Sonic sells them, but I've had cherry limeaides long before the chain came to our area. It is a really simple recipe. To make a single serving you will need: a can of Sprite, a bottle of grenadine syrup, maraschino cherries, and limeaide. You can purchase limeaide in cans in the frozen food section near the frozen orange juice, or you can buy limeaide already made. All you do is get a glass, I'd suggest bigger than 12 ounces and pour in the can of Sprite. Next, you'll want to add in some of the limeaide. When I use the glass that I used to make my previous recipe, I end up having approximately a 1/4 of a cup left to add limeaide in order to fill up the cup. Next, you can add about a teaspoon of grenadine syrup in the glass. Add maraschino cherries and stir. Ta da, you have yourself a cherry limeaide! I'm not a big ice person, but you can add ice in the glass as well. I never measure out the ingredients, I just eyeball it and once you've made this a few times you'll be able to make it that way as well. So grab yourself a glass and make yourself a nice summer mocktail. Cheers to you! these mock-tails sounds fab-u-lous. Thanks for sharing! I enjoyed your guest post & the mocktails sound yummy. May have to whip up a cherry limeade tonight.